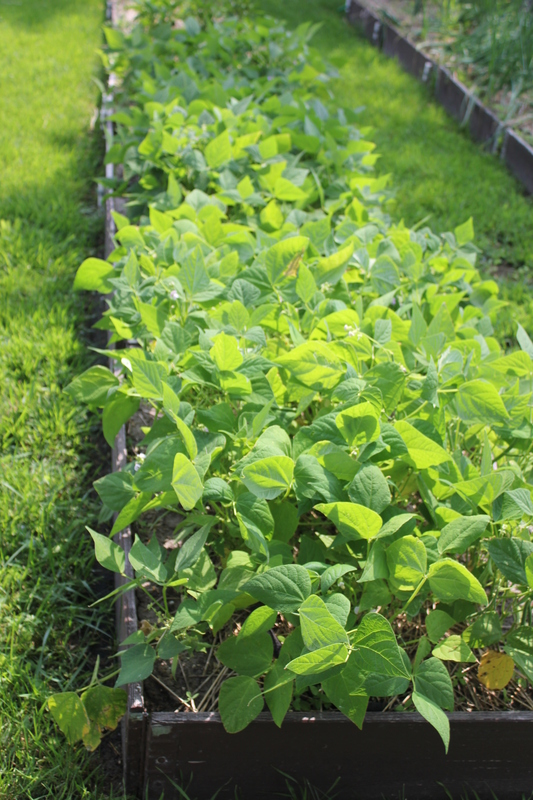 Green beans, string beans, bush beans and pole beans…so many beans, so many ways to grow them, preserve them and eat them! I am a Green Bean fanatic when it comes to fresh summertime eats from the garden. They are always best fresh, cooked to perfection and served with or without butter. My son may argue with me as every year I inevitably have to fight him from eating the pods directly from the plant! After all, I want some too! My first year of gardening in the above ground boxes turned out to be a total disaster when it came to green bean output. Due to the limited space I was 100% certain pole beans would be the way to go. Maximize the space by growing up, right? As a matter of fact, in my case, I was very wrong indeed. When contemplating what type of bean may produce best for your space, take into account the air space as well. What I mean by this is examine the area above and around your garden. Do you have adequate sun light? Would vertical growth cast unwanted shadow? How windy or breezy is the area you intend to plant? My largest mistake was not recognizing the amount of shadow vertically growing plants would cast. The garden, already in the most open position of the yard is already cheated from early morning sun in the East due to tall old growth trees and underbrush. In most cases, this would still leave an adequate time frame for my garden to absorb the sunlight it requires. However, as a result of the total accumulative shadows my beans didn’t exactly bask in the sun. The following year I changed strategy by choosing to plant bush beans noted as being a high producing variety. Not only did I have happy, healthy plants but I had beans galore! Bush beans rock! Not to knock pole beans, they can also be good producers when they have the right environment to grow in. My mom grows vertical beans year after year with great success. They are great for full sun areas where you don’t want to be on your knees picking. Over the past 2 years I have progressed to growing more beans to support seed saving for the following year’s garden. By marking pods I intend to leave on the plant until fully matured I reduce my need to purchase seeds. 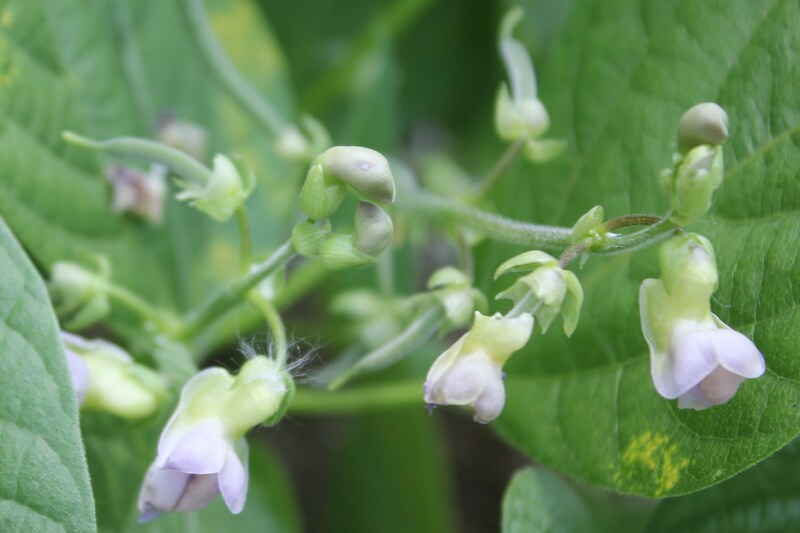 Limit the number of saved pods per plant to 1 or 2 otherwise you may risk slowing the production of more beans for eating. Seed saving not only keeps more money in your pocket but it also insures the availability of favorite varieties – in my case, I look for heirloom organic seeds. Once pods turn yellow and start to dry, you can harvest the pods and shuck the seeds. Just be sure everything is dry before storing them in a cool, dark location until spring. A further note on harvesting green string beans, make sure you do it regularly. By picking your harvest consistently you encourage the plant to produce more fruit. Also, be careful to not damage the plant or bean producing flowers as you collect your bounty. The nicer you are to your plants the more productive they will be for you. 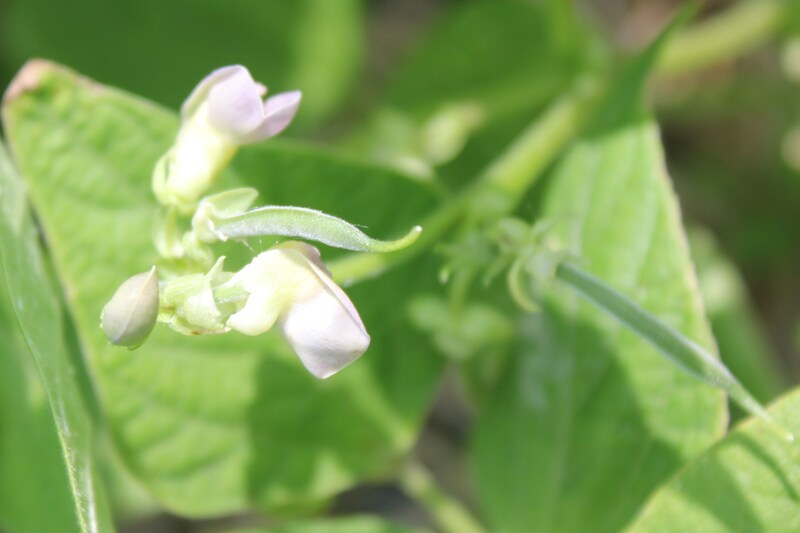 Some other things you will want to watch out for when growing beans are pests. Pests can have quite an appetite when seedlings are young and tender. In my first season, I struggled with slugs which can be controlled quite well with diatomaceous earth, beer traps or conventional slug bait. Bug dust such as Seven can also assist with deterring insect pests. For those seeking a more organic solution I have found success using a spray mixture of Neem Oil & Organic Dish Soap in water. I remember thinking the old rule of avoiding picking beans after a rain was wives’ tale. Fortunately, I didn’t have to learn the hard way but was set straight by my own mother while having a gardening conversation. When plant leaves are wet, a bacterial blight is more easily transmitted. 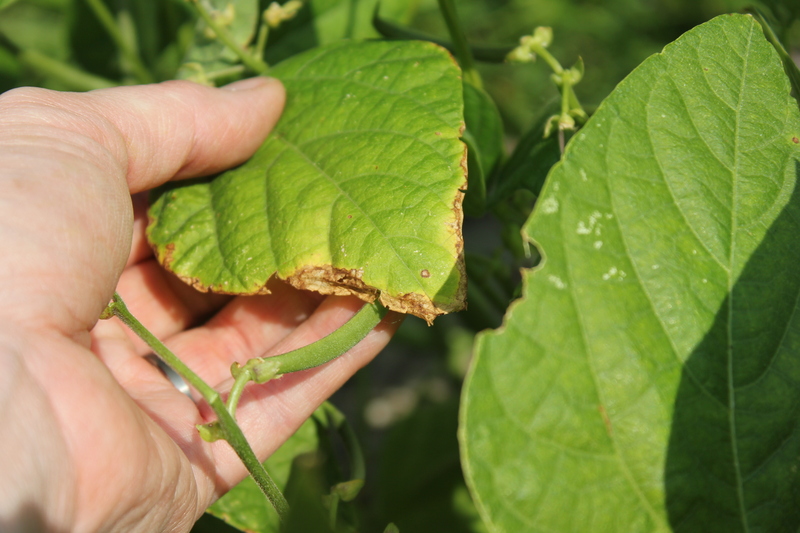 You can further help avoid bacterial bean blight by plucking off infected leaves and disposing of them. Anything brown, yellow or a mix of the two should be considered suspect. As always with any plant infection, remember to crop rotate in order to avoid reemergence of the disease. So, what else is there to know about green beans? 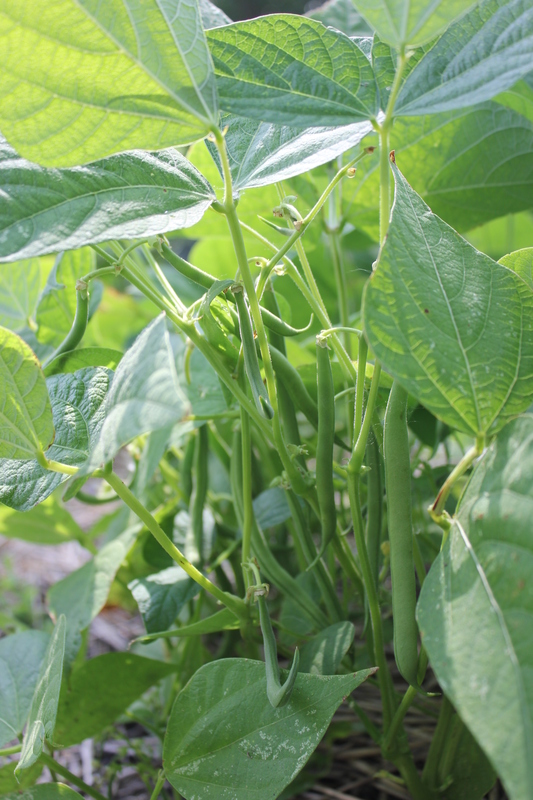 Here are some quick ideas for saving your green bean harvest for future use. Freezing green beans whole or cut. First, trim, wash and blanch beans in boiling water for 2 minutes. Pat dry, fill your freezer bags and place in the freezer until you are ready to use them. Refer to a canning book for proper canning procedures. You may preserve them plain, you may pickle them for spicy dilly green bean pickles (great in a Bloody Mary BTW) or you can even add them to a pickled veggie mix. Have a jar of pickle juice in your fridge? Add some green beans to the liquid and allow the magic to happen. In about a week you’ll have some fabulous green bean refrigerator pickles! Green beans are 2nd only to tomatoes in our garden year after year we love them!!! Bush beans are the favorite!! !